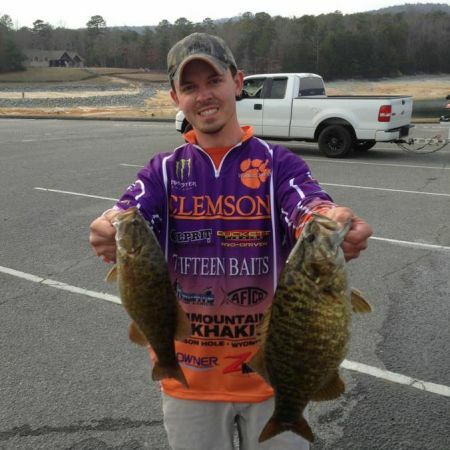 The Clemson Bass Fishing Team\'s Open Fundraiser Tournament is this weekend! See the attached tournament flier and tournament rules for details! 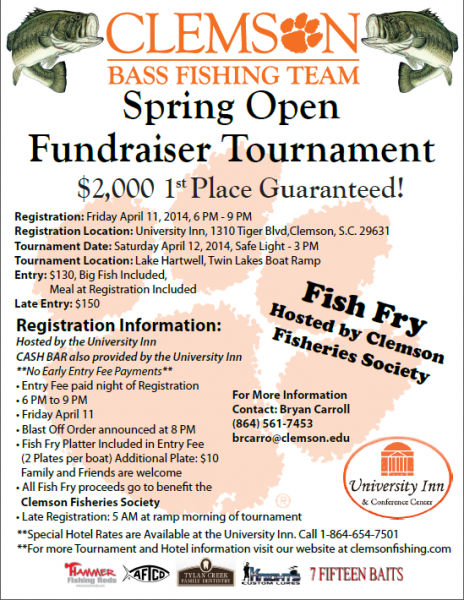 The Clemson Bass Fishing Team is having a fundraiser tournament on Lake Hartwell April 12th, 2014 to help raise money for them to travel to tournaments this Spring. In addition to the tournament we are having a fish fry registration the night before (April 11th) to benefit the fisheries society. Fisherman, friends and family are all welcome at the fish fry. Tournament entry fee includes two fish fry plates for competitors and additional plates for anyone else who wants to come out and eat are $10. The flier is attached to this post, if you can make it please come out and help support a great team of college anglers! I'm current President of Clemson's Bass Fishing Team. I have a bachelors degree in mathematics from Clemson. I'm currently working to complete my master's degree from Clemson in Statistics. I'm an avid bass fisherman and I love to hunt. I'm currently fishing the Collegiate Bassmaster, Boat US and Fishlife tours.